Amour (Michael Haneke, 2012) | Shut Up Hamish! That Emmanuelle Riva was not given the Best Actress award for her performance in this film is criminal. The 85 year old plays Anne, a once highly skilled pianist and wife of devoted husband Georges who is faced with dwindling physical and mental health after suffering a series of strokes. Georges, payed by Jean-Louis Trintignant takes it on himself to care for Anne as he obliges her wishes of not to return to a hospital during her last days. It is a theme that all of us can relate to in some way, either though watching loved ones fade away in a similar way, or through imagining our own challenges that are to face us in old age. For this reason as well as the film’s expert execution it is not surprising that the film has picked up such acclaim, with Michael Haneke recieving his 3rd Palme d’Or at the 2012 Cannes as well as the Best Foreign Film award at the 70th Golden Globes and at the 85th Academy Awards. 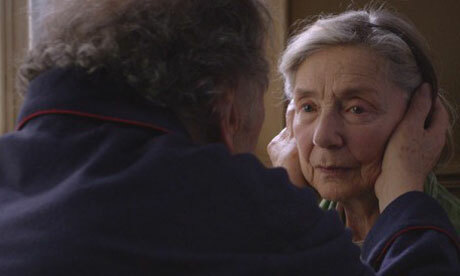 Haneke directs his elderly actors through one demanding scene after another, particularly from Riva, who gives a powerfully dedicated performance as a paralysed stroke victim. I had become so immersed by the performance that it was not until I left the theatre I was reminded that I was viewing the work of an actress and not the actual fading of health of a person on screen. It seemed to me it must have been very demanding for an 85 year old to play a role like this with such conviction. Jean-Louis Trintignant should also not be overlooked, having returned to the screen after a 14 year absence to bring to life this performance of a man struggling to cope with the pressures of watching his life companion fade in front of his eyes while using much of his strength and sanity trying to do justice to her last wishes. The film focuses on a more specific and tender subject matter than Haneke’s previous films, although is not absent from the dark and bleak. The film is still a tale, and in spite of the believability of the actors and the situation, the films finale (and somewhat it’s beginning) do fall into more melodramatic territory than what another director playing the subject matter straight perhaps would. Not to say that these events could not happen in real life, but they are at times taken to their most depressing and anguished extremes. Illness and death in old age that I have witnessed have never been as bleak as this, but then this is a film, not real life and a tale taken to such dramatic extremes as this does make one ponder mortality, old age, the treatment of our elderly and the nature of love. For a film to make one reflect on topics such as this, while being a gripping and expertly executed example of cinema, must deserve all the acclaim given to it.